When it comes to home audio and video installation, your options are to either hire professionals to do the installation or try your hands at it. If you hire professionals, the job will be completed in a timely manner because that is what they do for a living. If you do it yourself, it will take a little longer, but the sense of satisfaction you feel after the job is done will be worth the time and effort. Since the professionals know what they are doing, we will focus on what happens when you do the home audio and video installation yourself. Before you begin the home audio and video installation, you have to make sure everything is where you want it to be. This means you should already have your television, speakers, sound system, DVD/Blu-Ray player and all the electronics you plan to install ready to go. It is important to do this before you begin the installation because it is more convenient to move them around before they are plugged in. Once you connect them, you will have to disconnect and reconnect everything if you want to move any of the appliances. 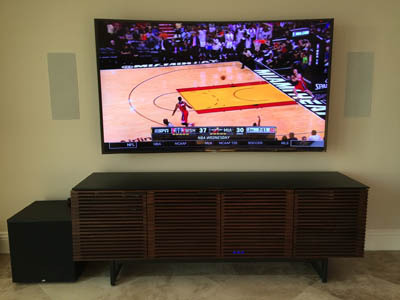 These days, when most people are undergoing new audio and video installation, they try to create a home theater experience, which means both the audio and video appliances are connected to each other. Even though most brands are compatible, professionals recommend sticking with the same brand when it comes to audio and video appliances because you do not have to worry about the appliances being compatible, and getting same brand appliances to work together is usually easier than using two or three different brands. If you do not have a choice or cannot afford to use the same brand for both your audio and video appliances, you should make sure that you check the manual of the devices you want to pair together to make sure they are compatible and will be able to sync up. If you are not yet ready to buy the appliances, you can still find out if they are compatible by going online and checking the manufacturer’s website to find out which brands their devices are compatible with. Once you have verified that the devices you want to connect are compatible, you can start to connect them and plug them all in. Even if you have done this before, it is a good idea to use the manuals that come with the devices to make sure you connect them properly so you do not damage them before you start using them. If you are unable to get the devices to work the way you want them to, you can do troubleshooting online or contact customer service for help. If you are still having problems getting the devices to work properly, you will have to call in the professionals to complete the installation. Home audio and video installation can seem daunting at first if you do not know what you are doing. However, following the instructions provided makes the process easier. If you are planning on a new audio and video installation, these tips should help you get started on the right path.